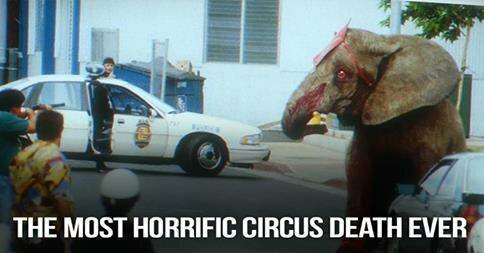 Tyke, a 20-year-old female African Elephant, was in Honolulu with Circus International. On August 20, 1994, during the show, Tyke entered the ring at the Blaisdell Arena, kicking around what looked to audience members like a dummy. “We thought it was part of the show,” one witness told the Honolulu Star-Advertiser. They soon realized the supposed dummy was a severely injured groomer. Panicked, audience members fled for the exits. Tyke went on to fatally crush her trainer, who was trying to intervene, before fleeing the arena herself. For nearly 30 minutes, Tyke ran through the streets of the Kakaako neighborhood’s business district at rush hour, nearly trampling circus promoter Steve Hirano when he tried to fence her in. It was a foot chase between her and the Honolulu police, who eventually shot her 87 times before she succumbed to nerve damage and brain haemorrhages. People watched aghast from their cars, apartments and the sidewalk. While the Tyke incident challenged people around the world to think about our relationship to circus animals, many circuses such as the Kelly Miller Circus, UniverSoul Circus, Cole Bros. Circus of the Stars and Carson & Barnes still use exotic animals, including Elephants, in their shows today. Ringling Bros. and Barnum & Bailey Circus has only recently stopped using Elephants in their circus. What can you do? PETA encourages you to avoid supporting any circus that includes animals and provides a list of animal-free circuses, as well as a list of things you can do if the circus comes to your town.